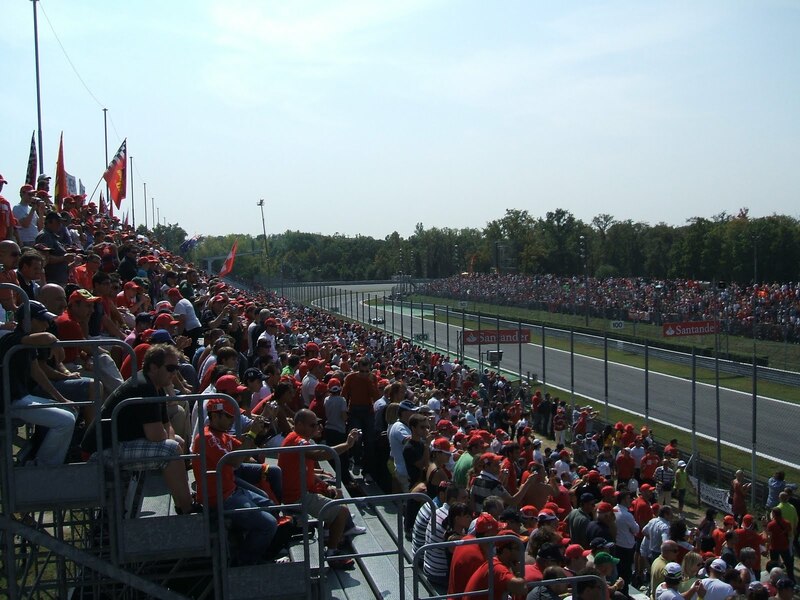 Talking about F1: The F1 blog: Monza Preview: Red Bull to find a new frontier? In F1, as with many things, you've either got it or you haven't. And without doubt Monza has got it. 'It' isn't always that easy to define, and so it isn't with Monza. But most likely it is related to a combination of the track's unparalleled heritage and the intense atmosphere provided by the Ferrari-loving tifosi looking on. Monza's seen cars racing here since 1922, and the layout, other than the addition of chicanes and the coming and going of a fearsome banking section, has remained broadly untouched in that time. Only in one season, 1980, has Monza not featured on an F1 calendar - no other track can boast anything close to that level of incumbency. All of F1's legends have raced here, many have perished, and the ghosts of warriors past seem to be conspicuous in the place. The list of Monza Grand Prix winners reads like a who's who of F1 history. 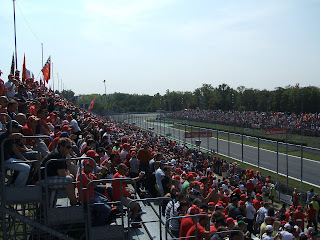 Compounding this are the fans: few can match the buzz and passion of Monza's Ferraristi. There are some things that the money spent on the Tilkedromes can't buy. When F1 cars are at Monza all seems right with the world. Monza is, and always has been, all about speed. Around three-quarters of the lap is spent on full throttle and there are only six sequences of corners, by far the fewest in F1 currently. These characteristics led many to assume that Monza wouldn't be Red Bull country. History suggests so as well, the Bulls haven't so much as ever claimed a podium here, fourth place last year for Vettel being their best ever result - astonishing for a team who have been right at the sharp end pretty much permanently for the past three seasons. But this weekend may represent the Red Bulls, not for the first time this season, finding a new frontier for themselves. They've been bowing to no one in practice today, and Sebastian Vettel topped the charts in the second session as the track temperatures picked up. It'll be comforting to them that such temperatures are forecast to stay for the duration. But this shouldn't be a surprise. As mentioned, Red Bull have been competitive everywhere this year, their variation in potency from track to track seen in 2010 and before apparently licked. Indeed, they gave away very little on straightline speed at Spa two weeks ago, another track on which much of the time is spent on full throttle, and Seb of course took the pole and win there. McLaren once again look like they'll be the Bulls' closest challengers. They dominated the first practice session and were close to the Bulls' best times in the second (though traditionally the Bulls tend to run higher fuel loads in practice than the McLarens do). Their Mercedes engine shoves plenty out, Button is in good form and Hamilton sounds like he's determined to prove something after his Spa shenanigans, so they should be there or thereabouts. They also appear to be running more rear wing than the Bulls, indicating a fascinating factor of this weekend. That Monza is dominated by long straights means that in practice and qualifying the DRS will be deployed for much of the lap. Further, on race day, and for the first time, there will be two independent DRS zones, both of which are generous (though on the flip side, Monza's skinnier rear wings will give less of a DRS advantage relatively speaking). Therefore, teams may be inclined to run more of a steep, downforce creating, wing angle than the usual Monza skinny set up, hoping that the DRS deployment, both in qualifying and the race, will neutralise the greater drag, as well as that their pace in qualifying and onto the straights in the race will keep them away from pursuers. Indeed, Jenson Button damn near won the Italian Grand Prix last year with a similar strategy, except using the f-duct (remember those?) to ensure he wouldn't be a sitting duck on the straights. All teams will have a decision to make on this one. Then there's Ferrari, the home favourites, who were expected to be strong this weekend. In short, they haven't been so far, even though they've been getting the warm, dry weather they've been craving for a while. Indeed, Fernando Alonso has admitted that they have work to do. However, tyres may yet save them and give the tifosi something to content themselves with after all. Despite some stricter rules on cambers (the indications are that Pirelli's advice on maximum tyre cambers may become a binding rule this weekend) it appears that tyre blistering will be a factor for the second race on the bounce. While Monza doesn't have many corners to distress tyres on, the speed on the straights can be bad for tyres' health by them being squished down onto the road under loads at speed, and the evidence of today is that this is creating problems. Ferrari appear to be having less of a problem with this than their rivals, which may mean they come stronger on Sunday, some speculating that they may try to stop one time fewer than those around them. But the problem is that after tomorrow they could give themselves too much to do in the race. This is especially as Mercedes, strong on the straights and with an efficient DRS, may interlope the 'big three' (Schumi was quick in practice today). It's also not clear how easy passing will be come race day. Then there's the elephant in the room: Ferrari will have to run the medium tyres at some point on Sunday. And they can't blame the weather this time for poor pace on them, so nowhere to hide. Plenty for everyone to think about for tomorrow and Sunday.